If you're in the Philadelphia area, then you know that this weekend is all about the Philadelphia Eagles. 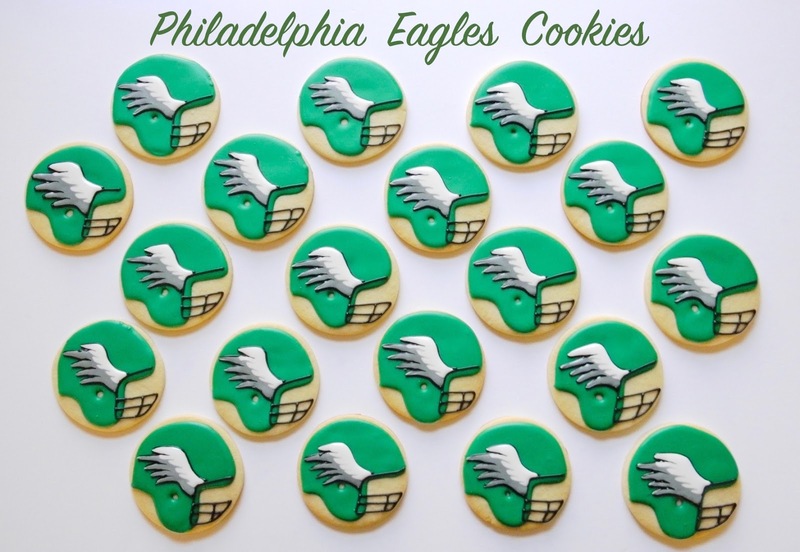 A week ago I was asked to make some custom Philadelphia Eagles sugar cookies for my favorite cafe. Going through images of the football team's logo, I narrowed it down to the football helmet that all of the players use; a Philadelphia green helmet with the wing of an eagle. After making one large batch of them, I was pleased with the results. Needless to say, people went crazy over them! Throughout the week I had to make dozens and dozens of cookies, and each batch sold out within a few hours of arriving at the cafe. You don't have to be from Philadelphia to support my city's football team. I have friends in North Carolina, Massachusetts and California, who are behind the Eagles. 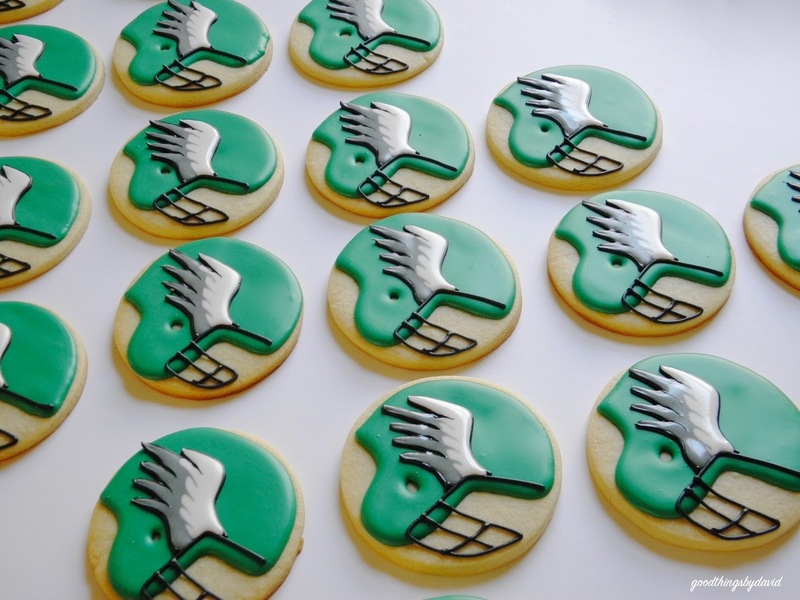 What better thing to have for people at your Super Bowl party than a plate full of Philadelphia Eagles sugar cookies? Let me show you how easy they are to make. 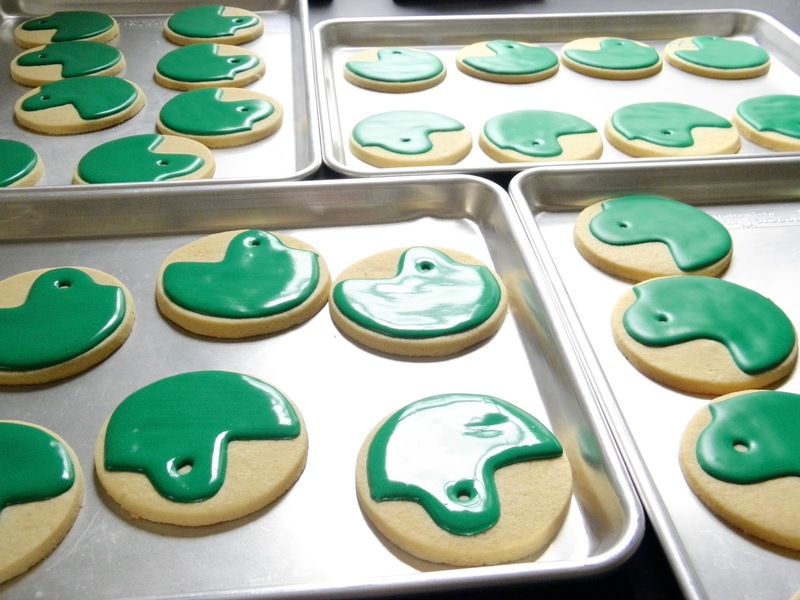 Make several batches of my tasty sugar cookie recipe and then a couple of batches of my royal icing to decorate the cookies. 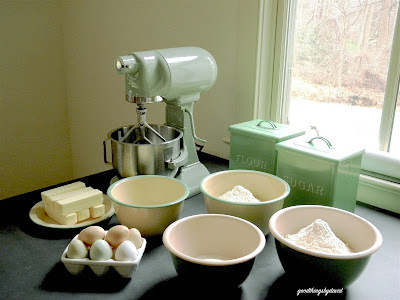 Here I am using my commercial Hobart mixer to make this an effortless process. 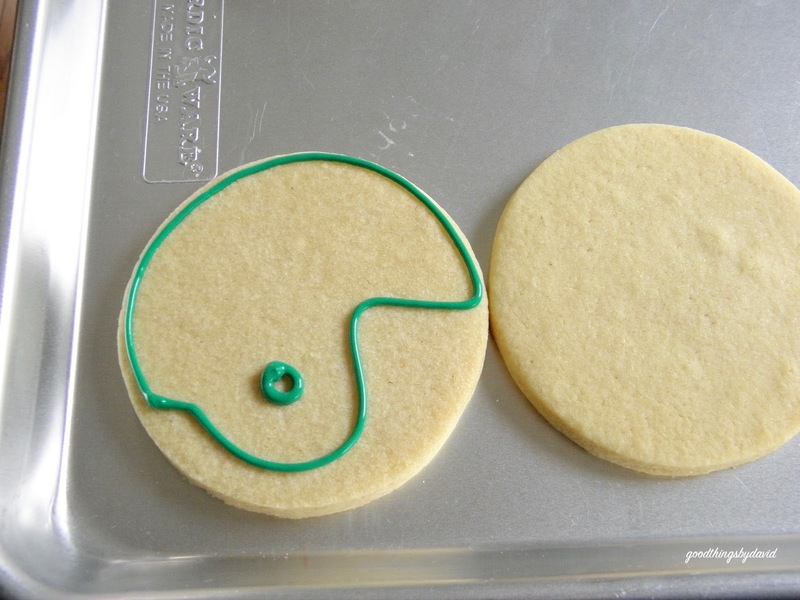 Roll out and cut 4" rounds, and then bake and cool the cookies. After you've mixed the royal icing, tint a large batch of it using a combination of Ateco turquoise, Ateco leaf green and a drop of Ateco black, to get that unmistakeable Philadelphia green color. It's not quite full on turquoise or leaf green. It's somewhere in the middle, with a hint of black. Freehand the shape of a football helmet as shown above with the Philly green color, using either a #4 or a #5 piping tip. Don't forget to outline a small circle for the ear hole. This is the dam which will hold in the color for flooding. 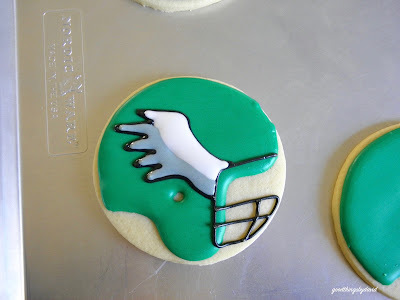 Immediately fill in the entire football helmet with the green color, getting an even layer of icing throughout the cookie as shown. Continue with the other cookies. It's important to let the base of the cookie dry completely before continuing with the decorating. 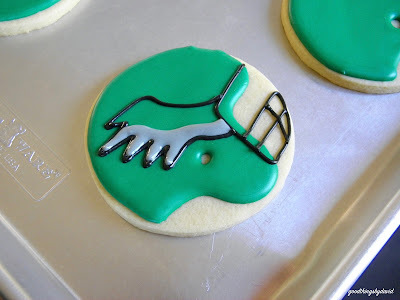 Using a black royal icing and a #2 piping tip, pipe the mouthguard area as shown, and immediately pipe the shape of that inimitable wing of the Philadelphia Eagles. Using a gray royal icing and a #2 piping tip, fill in the bottom 4 feathers as shown. Using white royal icing and a #2 piping tip, fill in the rest of the wing as shown. 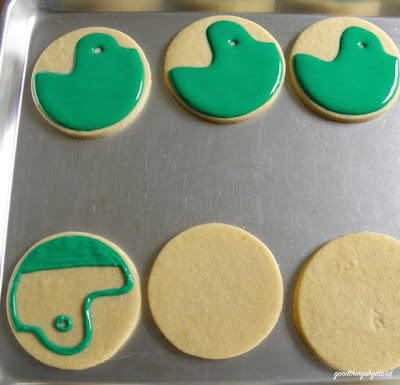 While the royal icing is wet on the wing, immediately draw out the gray icing onto the white icing as shown, using a cake decorating modeling tool or a toothpick. Do the same to the black areas where the feathers connect. Using the same decorator's pick, draw out the ends of the feathers. Let the entire cookie dry completely. Aren't these super easy? 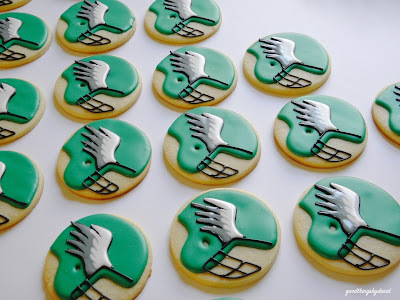 I know that if you decide to make a batch of these cookies for your Super Bowl party, you're going to be the hero of the day. Everyone is going to want to take one, so plan on making extras. They're not going to last. 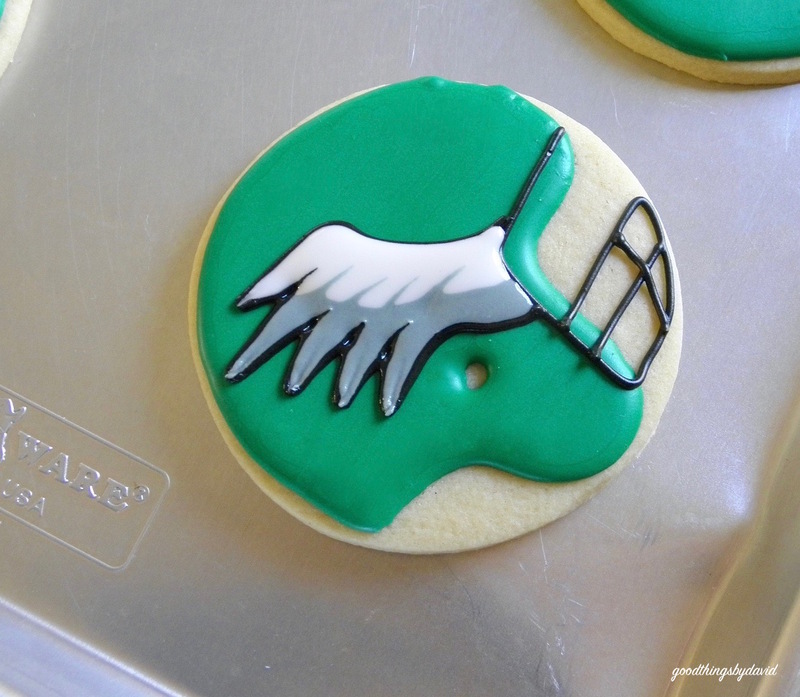 Whether you are rooting for the Philadelphia Eagles or the New England Patriots, get your cookie cutters out and make some fantastic football-themed cookies for tomorrow's game. Those are works of art! Your passion for perfection in your cooking/art is very inspiring. I think you'd better keep baking--the city will be partying for a looooong time. Maybe this was the magic mojo that pushed them to a victory. Maybe! It was a great game! !